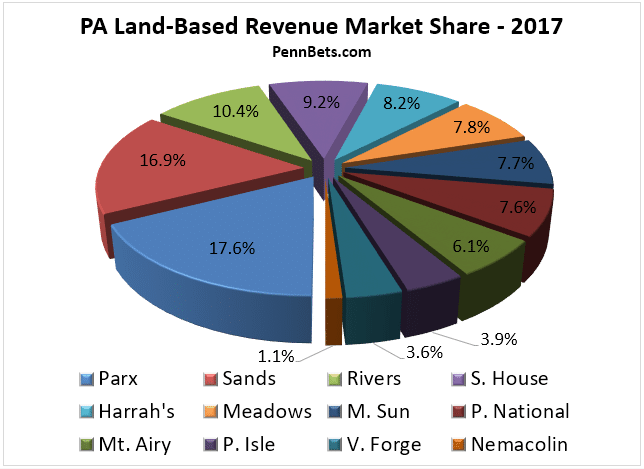 The final numbers are in, and Pennsylvania land-based casinos have set a new revenue record. In 2017, the state’s 12 brick & mortar venues combined for $3,226,909,823, beating out last year’s then record by a scant 0.42% and eclipsing their 2015 total by a modest 1.67%. 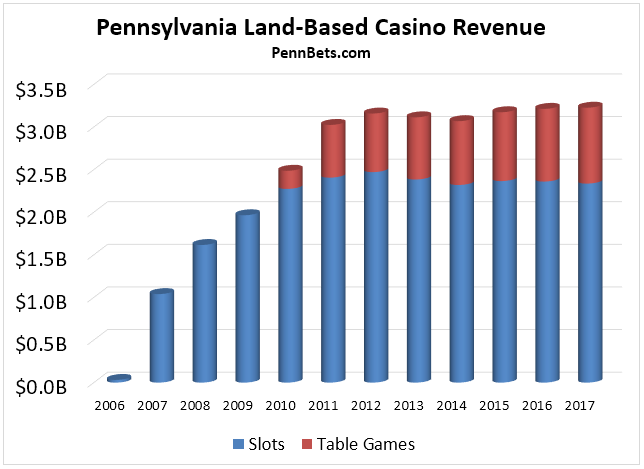 For PA casino operators, there really hasn’t been much worth getting too excited (or too frustrated) about in the past five years. Since 2012, industry revenue has varied by no more than $157 mm, or 4.9% of current revenue; a strong indicator of an industry that has settled into good old maturity. Of course, with a slew of new and expanded gaming options poised to become available, that could all change in a hurry. Setting a new revenue record is always a treat, but the margin by which the record fell was so tiny that few would argue if we concluded year-on-year revenue was flat. After experiencing insane growth in its first three years, and then in the first two years table gaming was permitted, gross gaming revenue has effectively leveled off, settling in between roughly $3.05 – $3.2 bb since 2011. Recent trends have been slightly positive, with modest gains recorded in each of the past three years, collectively accounting for nearly 5% growth. One might think that with revenue slightly on the rise, the state will also see its take go up. Not necessarily. Recent trends suggest that PA casinos are positioned to pay less in taxes for every dollar grossed going forward. This is because table gaming, which is taxed at just 16%, is rising in popularity, whereas slots (taxed at a whopping 54%) are dipping slightly in appeal. The changeover has been slow but consistent, with table gaming representing just 20.46% of all GGR in 2011 (its first full year) up to 27.60% in 2017. In 2017, table games generated a record $890.7 million in GGR, trumping last year’s high-water mark by 4.4%. There hasn’t been a single year when table gaming didn’t account for a bigger piece of the pie than the year before, and therefore little reason to suspect this trend won’t continue in 2018 and beyond. By our count, PA casinos forked over more than $1.4 billion in taxes in 2017. 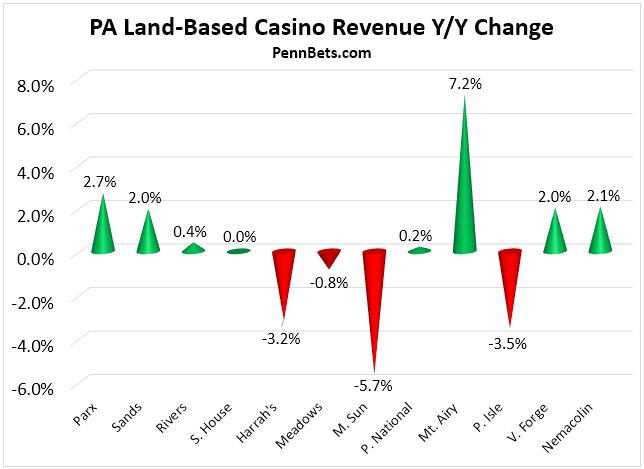 With just a couple of notable exceptions, individual casino revenues remained largely unchanged year-over-year. Parx Casino was once again top dog, marginally increasing its market share lead over Sands Casino. Rivers Casino came in third, followed by sister property SugarHouse Casino in fourth. The only change in the rankings was Meadows moved up a spot to sixth place, while Mohegan Sun Pocono dropped a spot to seventh. Mohegan Sun was also the biggest loser among the state’s 12 casinos, with y/y revenue dipping 5.7%. The casino experiencing a number of other woes in 2017, forced to pay fines totaling over $1 million. Three other casinos saw their revenue drop for the year, but not be more than 3.5%. On the flip side, eight casinos saw gains, although in reality, the only truly notable gain was by Mount Airy Casino. One of the state’s smallest Category 1/2 casinos, Mt. Airy saw its revenue soar 7.2%. At +4.1%, Mt. Airy was the second biggest gainer in slot revenue, only lagging behind Valley Forge Casino, and its table game revenue surged an impressive 17.6%. What’s interesting is that Mt. Airy targets a similar geographical region as Mohegan Sun Pocono, suggesting that its gains may have been cannibalized from the latter. All that said, the eighth place Mt. Airy is still nowhere near seventh place Penn National, which generated nearly $47 million more than its neighbor to the east. The impact of this broad-sweeping legislation is already being felt, with Penn National having recently won the first of ten slated satellite casino auctions. It plans to place the Category IV casino relatively close to its main facility in Grantville. However, 2018 will mostly be a set-up year for the mini casinos, with plenty of license fees paid but probably no spinning reels or cards dealt. 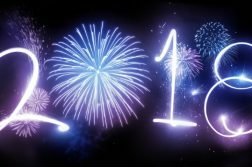 Instead, 2019 will likely be the first year we’ll see the impact of satellites on both the existing industry, and total land-based casino revenue. Online gambling could (and should) launch in the second half of 2018. 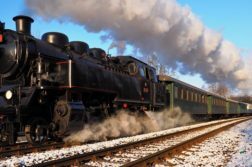 Yet the industry will be in its nascent phase, so it’s unlikely to have a noticeable effect on land-based traffic. Again, 2019 will probably be the year. Other verticals, such as the iLotto (expected to go live this spring), shouldn’t really impact land-based casino revenue, nor should DFS legislation, as bigwigs DraftKings and FanDuel were already active in those states before the legislation was passed. 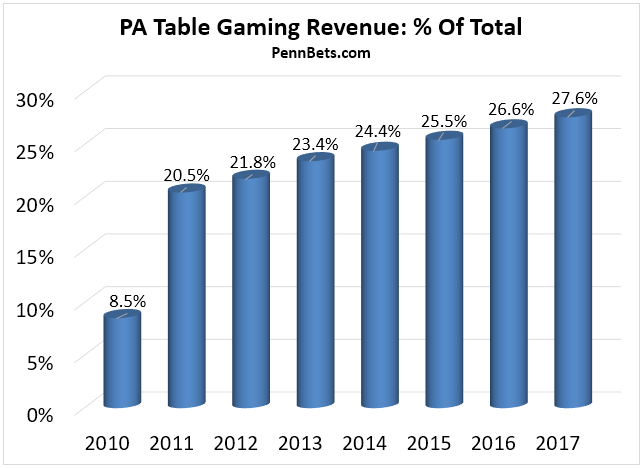 In short, what we’re looking at is more of the same-old same-old for Pennsylvania’s casino industry in 2018, with a major upheaval — and probably a positive one — the following year. Stay tuned.